Tales of the Unexpected is a collection of sixteen superb short stories, all of them very different, but sharing one thing in common—the unexpected ending. 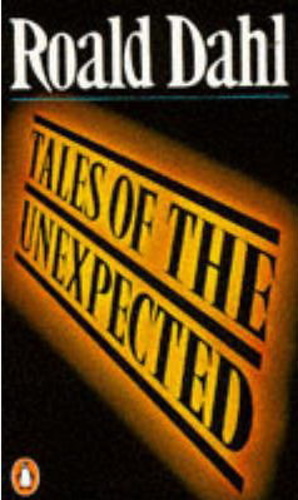 The collection contains all the stories that were later featured in the first Tales of the Unexpected TV series and there is such a variety of strange tales there should be one for every taste. When Mike Schofield has gourmet and wine connoisseur Richard Pratt over to dinner, he likes to play a little game with his guest—a guessing game—with a small wager on the side. Mike serves the gourmet with claret (which must be from one of the great years) and he must name the breed and vintage of the wine just by taste and smell alone. The bet? A case of the wine and Mike has never won. This time he feels sure that things will be different, but Pratt wants Mike to raise the stakes and wager his daughter. The tale of a devoted wife with a dead husband, a leg of lamb in the oven, and a house-full of policemen. “You like to bet?” the old man asks. “Sure I’ll always bet,” the younger man replies, but it is an unusual bet: the little finger of his left hand against the old man’s Cadillac. Arthur and Pamela are having the Snapes over for the weekend to play bridge, but when Pamela tells Arthur what else she has in mind for the weekend he thinks it is the nastiest trick he has ever heard. Another tale of gambling and greed. It’s amazing the lengths that some people will go to just to win, and Mr Botibol has bet all of his money on the ship’s auction. A business man travels the same route to work for thirty-six years, always taking the 8:12 train to the city. The same crowd is always waiting at the station. It is unchanging and unchangeable. Then ‘the new boy’ turns up and causes the business man to remember traumatic incidents from his childhood. A man living on the streets discovers that he was priceless work of art tattooed onto the skin of his back. Sir Basil Turton has been able to avoid his would be suitors easily, and has been free to concentrate on his love of art. Then Natalia enters his life, sweeps him off his feet, and along to the registry office. Spurned by his lady love, a man concocts an unusual revenge. He pays for her portrait to be painted. The room is very cheap and Billy Weaver is very happy with it, even if his new landlady does seem a little eccentric. But nobody ever really knows what goes on behind closed doors and Billy finds this out the hard way. William and Mary’s relationship has certainly changed since poor, old William died. Mrs Foster has a terrible fear of being late. Even the thought of it makes her so nervous that her left eye starts to twitch, and Mr Foster seems to be deliberately making her late. Mr Boggis is a rather unscrupulous antiques dealer, on a weekend he dresses up as a parson, to gain entry to people’s homes, and search for a bargain. Then one day he finds something very rare indeed. When her lover, the Colonel, gives Mrs Bixby an extremely extravagant gift she has to go to unusual lengths to stop her husband from getting suspicious. At six weeks old, Albert Taylor’s baby weighs two pounds less than when she was born. Then beekeeper, Albert, starts mixing royal jelly into her milk. When a stray cat turns up at their home, Louisa quickly starts to believe the cat is the reincarnation of the composer Franz Liszt. Edward is more sceptical. I read the paperback version of Tales of the Unexpected. It ran to 282 pages and I found it a very handy to delve into when I had little free time in between doing other things. It would be hard for me to pick a favourite from the stories above but, if pressed, I would probably have to go with either “The Landlady” or “Man from the South”. I particularly liked the characters in “Man from the South” and the way they interacted with each other. The Landlady is nicely unsettling and will always come to mind whenever I have to rent a room for the night.